A few days ago, Hayley of The Tiny Twig posted over at The Creative Mama about sprucing up your salad. Hayley’s salad looked so good that I craved salad, and made one every day last week. 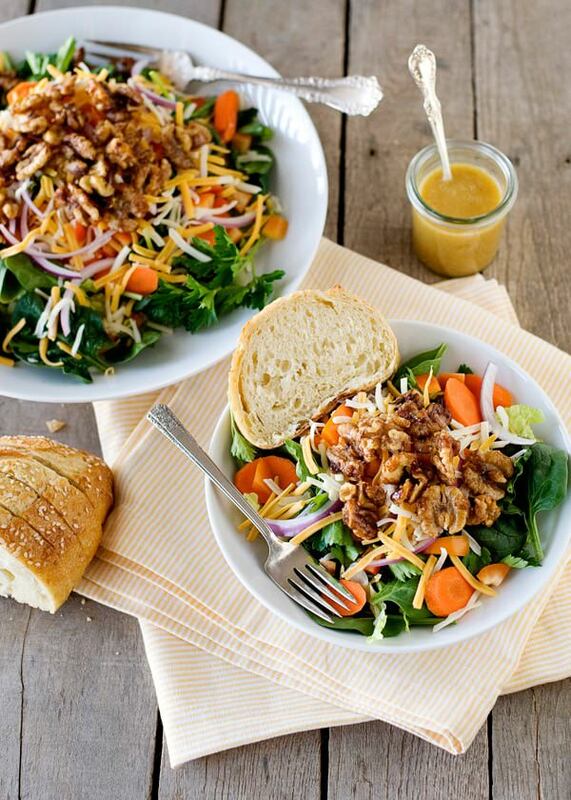 I think that salad is one of those things that taste so much better when someone else makes it for you. My mom was just here, and I bugged her to make me a salad every single day. 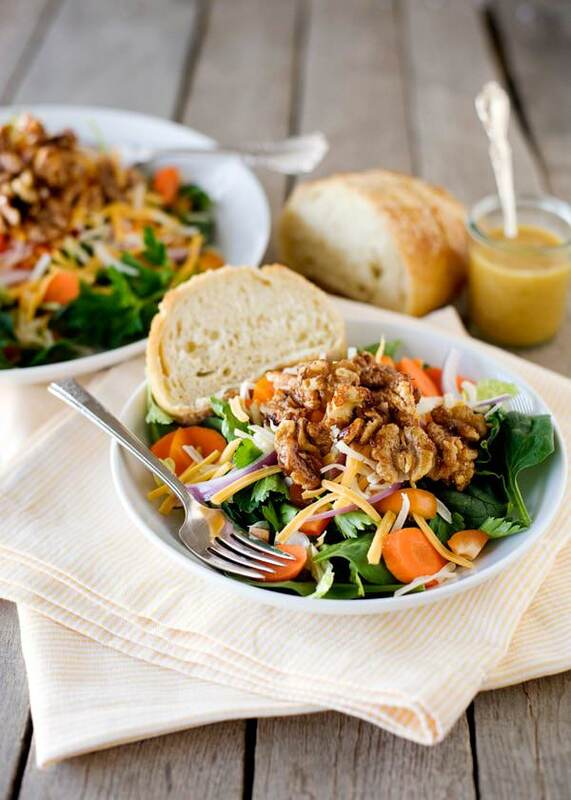 She really makes the best salad in the world, her dressing is always perfect. Even better, Clay has been asking for “tyrannosaurus salad” (he is into dinosaurs right now) every night for dinner. The thing that I think makes a salad good is a variety of flavors and textures. Nuts really add sweetness and crunch, and also a nice little hit of protein. 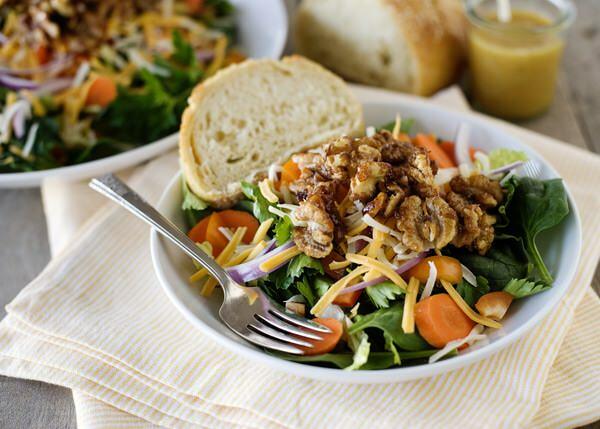 Hayley shared this slow cooker nut recipe, and I immediately had to make it. 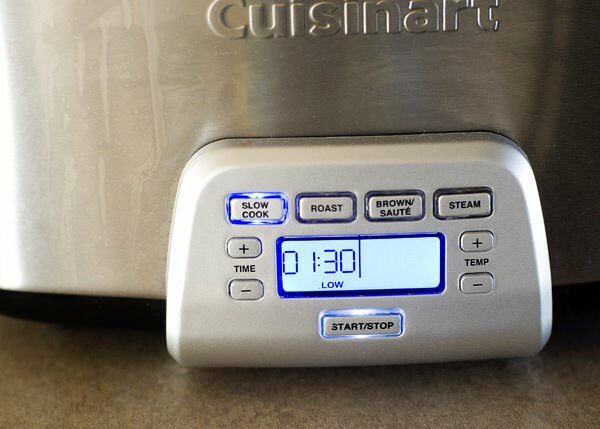 I love this method, she is so brilliant to make these in a slow cooker. Seriously, why have I never thought of this before? You can also make different variations. Add some heat with cayenne, or cumin. This recipe makes a lot, so I gave some to my friend Heather. She texted me about 10 minutes later asking for the recipe. I think that is a sign that it is a good recipe. These are really delicious just as a snack too. I am sharing a recipe over at the 30 Days 30 Ways with Mac and Cheese website. My Dressed Up Penne and Blue Cheese is one of the best mac and cheese recipes that I have ever made. Inspired from Lorraine Paschal, the method of slowly adding the milk to the roux, makes the creamiest sauce ever. Go check it out. Put all of the ingredients into the slow cooker. Cook on Low for 1.5 hours. Stir every once and awhile. After an hour and a half, the sugar will have melted, and the nuts will be coated. 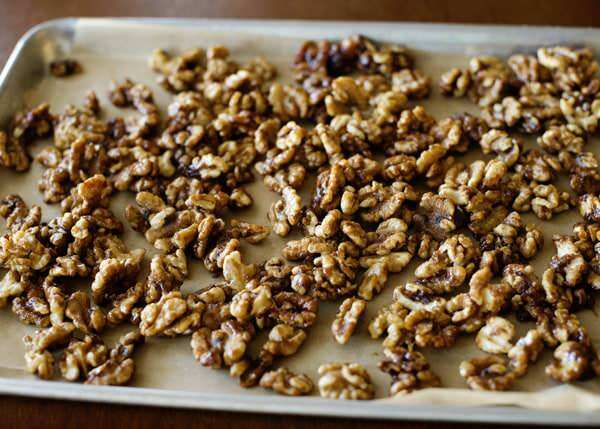 Spread the nuts out onto a parchment or wax paper lined baking sheet. Taste them and see if they need more salt. I like mine salty. Let the nuts cool. 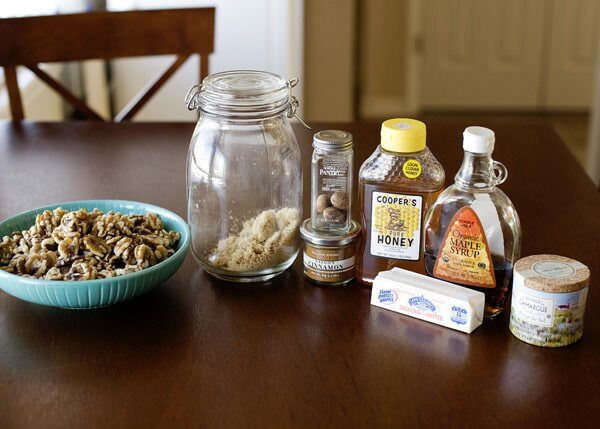 You can store the nuts in an air tight container for about 2 weeks. i wonder if almonds would work out the same way? sounds delicious. Absolutely! Any nut will work. Pecans would be great too. Oh my goodness YUM! Seriously Bree these walnuts look really good! totally worth dusting off my slow cooker for! And your photos…are so tack sharp, clear, vibrant, I could just reach into my screen. Gorgeous! Yes! Totally. I use my slow cooker all the time anymore, it should come off the shelf. Thank you for the love about my pictures. Some days are better than others, that is for sure! These sound like the perfect addition to a salad. I loooove sweet and spicy nuts! Question: why did you slow cook these and not bake, or pan fry them in the same sauce? What does slow cooking do to the nuts that makes them better?? For starters, it is less mess. Baking would work, but I tend to burn them. I just really liked how easy this method was, the coating was really even on all of the nuts, and I think that the slow cooking brought out more flavor from the spices. Yum! That sounds good. Coconut on nuts? Need to try that STAT. I just made these-and have overdosed on them already!! What a fantastic, easy recipe. I did add a little more salt which probably wasn’t necessary but I love salt!! Followed the recipe exactly and it made a lot. I think you could use any nut you like or have on hand-or why not do a mixed nut? I will be serving these on salads at https://sweetsixteencafe.com Thanks for the recipe-and using a slow cooker was a great idea. Me too, I go heavy on the salt. You can use any kind of nut that you like, the possibilities are endless. 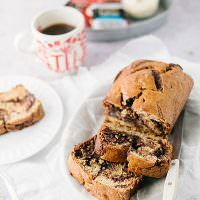 I just found your blog, and I’m loving the recipes I see. Can’t wait to try these sweet & spicy nuts. 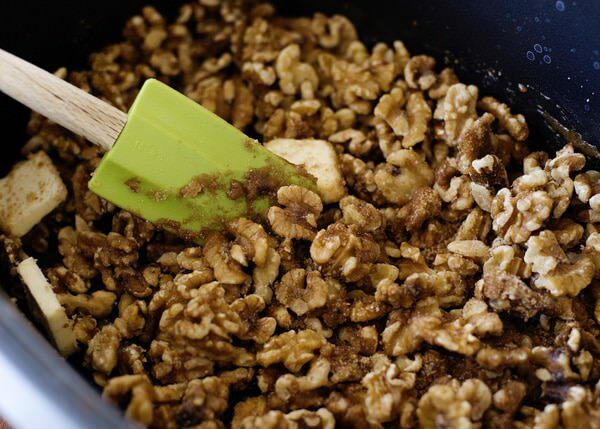 I’ve got walnuts and pecans in my freezer right now, so I think I’ll try both! 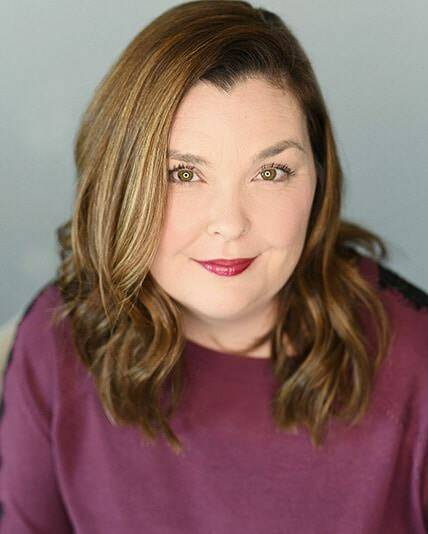 Welcome Tammy! I am so glad that you found me. I love that these are made in the slow cooker. And now I’m craving a salad!! It blew me away, why didn’t I think think of this ages ago? This looks like a great idea! Would be trying it out soon. Thanks for sharing! 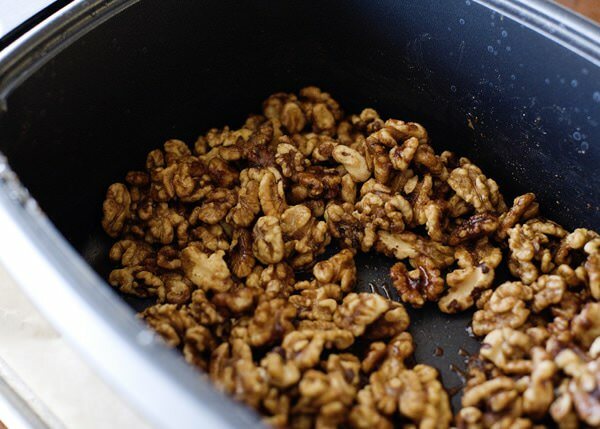 I LOVE making cayenne walnuts, but I’ve only ever baked them. Sounds like a fun recipe to try! It was so easy, and less messy. 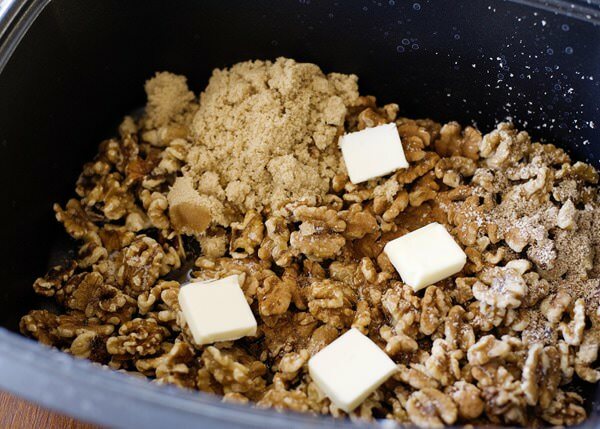 I NEVER thought of using a slow cooker for making sweet/salty nuts. What a great idea! Me neither! Hayley is so smart. These are WONDERFUL!!! I just finished making all of my holiday goodies and I had multiple bags of opened nuts left over. 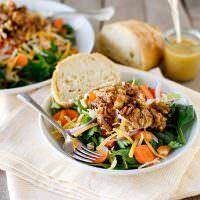 I decided to mix them all up and make this recipe using walnuts, pecans and almonds. Sinfully good and easy! I loved them so much, I put the nuts inside 4 oz mason jars tied with a pretty ribbon and added them to my Christmas treats I was delivering to friends and family. That is really good to know, thanks! I made this tonight as a matter of fact, a really spicy one, and it was great on our cheese plate. Were the nuts cruchy? Would it work well with just spices and no liquid? Yes, after they cool, they get crunchy. It will not work with out liquid. It needs it form the glaze. I presume that the top to the slow cooker is OFF during this? I added a little red pepper and a little ginger, and swapped the butter for coconut oil. Still turned out delicious, and so easy. I also used a bag of mixed nuts. Thanks for the recipe.